Work great and have good clarity up to 2 stacks, a little foggy when using 3 stacks but if you need that many its worth it. 100% products always good! Work great! Seriously a great product and would recommend that everyone try them out. If you are unsure on how to install Rocky Mountain has some great videos on it and makes it quite simple. I have never ridden with 100% Goggles before. But I needed a new set. I always purchase tear-offs for any goggle I buy that has the posts. When I usually end up in last at the start and get passed by the whole field in the moto it makes sense to have tear-offs. Plus most of the time we start the day with a wet track. Practice is a slush fest. I usually only do one lap during practice. I usually bring two bikes to race with so that gives me two laps. I do try to just stay in my own practice lap away from the other riders but they make me ride with the experience riders because of my age. I'd rather get out there with the peewees to have less chance of getting mung'd up with what looks like bull doo doo mixed in with red clay and sand. Sure taste like poop when it gets in my mouth. Another great product for a great price! Thanks again! It was at my mail box in a super short amount of time, no shipping delays or anything. They are easy to afford and well worth the money. I definitely recommend this product! These fit fine and a must for trying to keep your original lens clean. Match these bad boys up with your 100% goggles and never have trouble with vision again. They are easy to install on the goggles and come off the goggles just as easy when pulled. Highly recommend stocking up on these, and always having extras with you. Great for extending lens life, from harmful branches and debris. Best goggle tear-offs I've used. This product definitely gets two thumbs up. I recommend to all that are interested in keeping their Google's from getting badly scratched by dirt and debris on the trail. My whole family uses this product every time we ride,and appreciate the quality. I'm in no way affiliated with this product. I just like the idea of prolonging the life of my Google's. Tear offs are a must in off road. Lenses get scratched to easy. Everyone asks how i have so many tear offs and how can i see? Laminated Bro! Another cool trick: Clean lens, then peal off the back tear off, stick the stack to your lens and you've not got a dust/water Resistant tear off stack. Just enough static and sticky stuff to keep wet branches from slapping water between the back tearoff and your lens!! tried and true. Same for the dust. No more pealing them off after a dust race to clean between the stack and lens. Love these 100% laminate tear offs. Easy to install, easy to use, and provide super clear vision. I also love that 100% uses the same lenses on there goggles, you never have to worry if these tear off will work with your 100% goggles. I use and trust these at every race that I race. As usual, 100% is a great product and received the items very quickly! I got these for my son to use and to help protect the lenses. haven't used them yet but I'm sure they will work out great. They work well, however a bit on the pricey side. For a race I definitely would recommend, but not for recreational riding at your local track. These guys do the job - work on all my 100% goggles. Do just what they are intended to do. Thanks for making a great quality product, as usual! 100% tear offs fit perfect and work great . I also have the roll offs that I actually prefer when riding in the mud . Can’t go wrong with either just rider preference. It's cool you can install a 7 stack. But... they don't sit flat on my Racecraft frame. They sit up on the ends which allows dirt to sneak under the tear off stack. I will go back to the regular style that you have to stack one at a time. They fit well and are clear. Not much else to report. I am rating the laminated tear offs. 7 tear offs laminated together.I used individual tear off for years and could never keep moister or dust from getting between them and distorting my view. Then i found these laminated tear offs, Clear view with 7 of them on. Almost a dollar per tear off, so I don't waste them. I like not having to put each individual tear off on, and the vision through them is better. This product is great. They fit almost any style goggles and are super easy to install. Makes the lens last way longer and easier to see as well. These are a must to protect your lenses and have clear vision all moto. 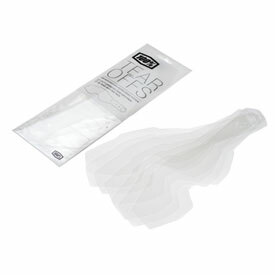 They come in a harder plastic packaging making it great for keeping tear offs from bending and better for storage. I am a trail rider - not a racer. I use these to protect the lens on my goggles. Works perfectly. I usually use just one - and clean it a few times before replacing. Clear Vision is a must! Does what supposed to do. I love them! I have already used a pack and I am definitely going to order more. A great price for a great product. It is amazing how clear they are . Only can speak for the laminates here: Bought more than a few sets of these with no issues. Clarity is great and i've had no issues with trying to pull one and them all coming off. The only complaint is the price $20 is pretty steep. Great tear offs. Easy installation. Affordable. I stock up and buy multiple packs. If you have a vented lens, you'll need to trim these tear offs before use because they'll cover the vents. After that, they work great. Strata goggles with tear-offs are good. What is the difference between laminated and regular tear offs? BEST ANSWER: Laminates are several tearoffs layered on top of each other so not to allow moisture or dirt in between them as this is what happens to single stack tearoffs when in competition, dirt and water get in between regular tearoffs and distort your vision. Laminates are the only way to go. The more the better.I believe they come in stacks of 4 and 8. Laminated tear offs come as a pack so it gives you several tear offs that are easy to install. Regular tear offs you have to install one at a time to get multiple lens. Can be time consuming. If you are only going to go through 1 or 2 then go with regular. If you need more laminated is the way to go. The laminated do not have a seperate paper layer between them in the package. You need to put them on 1 at a time, where as the laminated are bundled and just put on a certain amount. Keeps the dust from between the layers. laminated tear offs come as a stack and are installed as such all at once. regular tear offs are installed one at at time. They can still be installed in a stack. regular tear offs are single tear tear offs that you stack on top of each other. laminated are stacked an laminated together. Laminated are several individual tearoffs stuck to each other.